But Pike and Jennifer are not the only ones heading into the rain forest in search of hidden treasure. A Canadian mining company is determined to explore the Biosphere for rare earth metals, even if it means destroying the way of life for local villagers. When they learn that Pike and Jennifer's impending historical discovery might thwart their plans, it sets the newly minted team on a crash course with a group of men hellbent on getting their hands on the prize, no matter the cost. 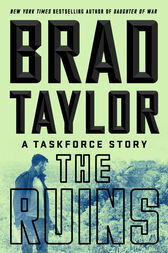 Includes an excerpt from Brad Taylor's latest Pike Logan thriller, Daughter of War.